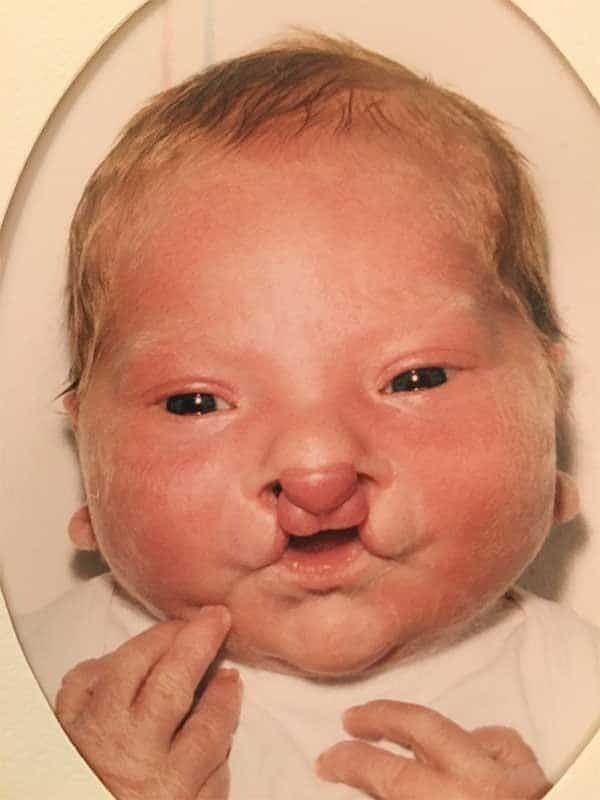 In this case study the patient was born with a bilateral cleft lip cleft palate. Fig 3. This was repaired shortly after birth and was followed up with several surgeries. He has one surgery left on his upper lip then his repair will be complete. 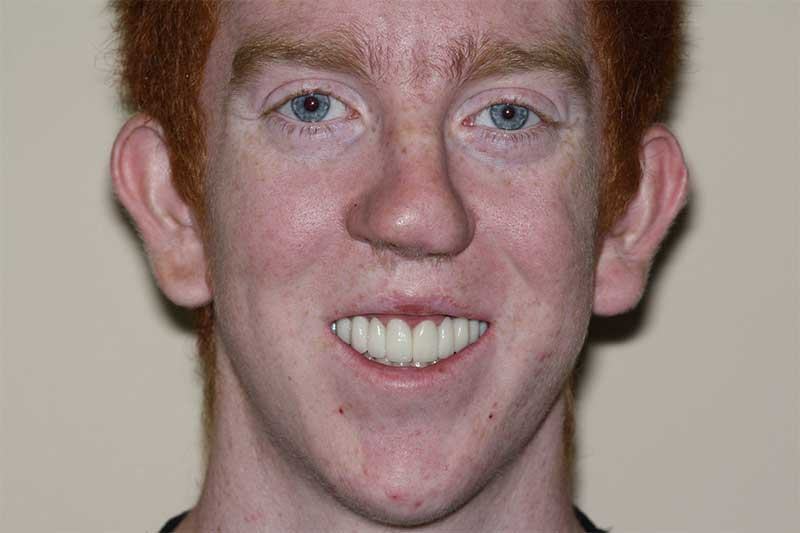 This patient came to our dental office in Chattanooga right before his braces came off for a consultation on how to make his teeth look normal. 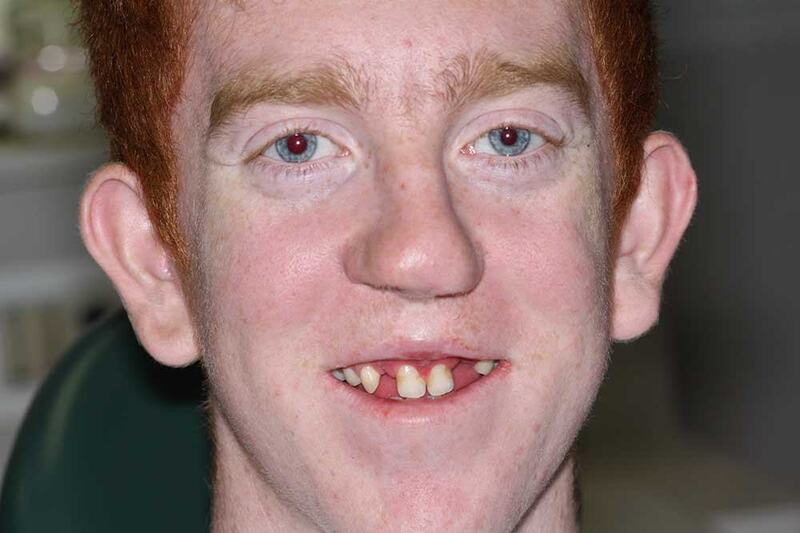 He is missing his top lateral incisors. 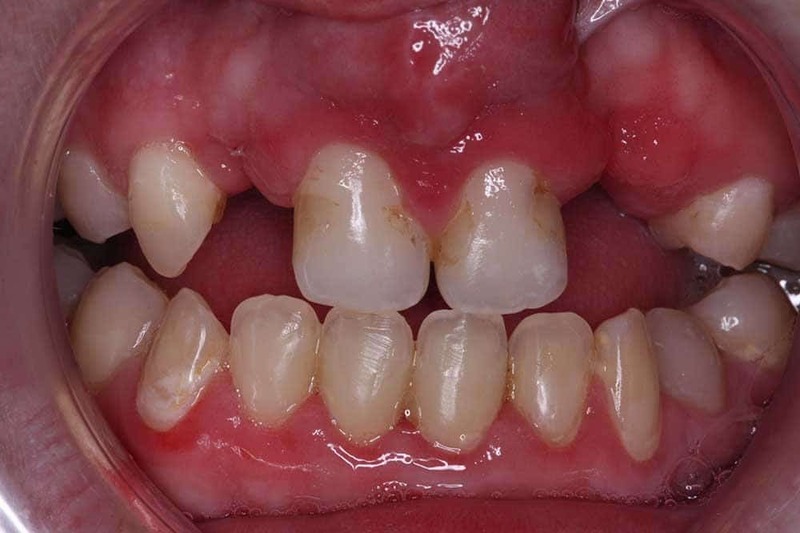 This is the most common missing tooth, and it is almost always missing when the patient has a cleft palate. 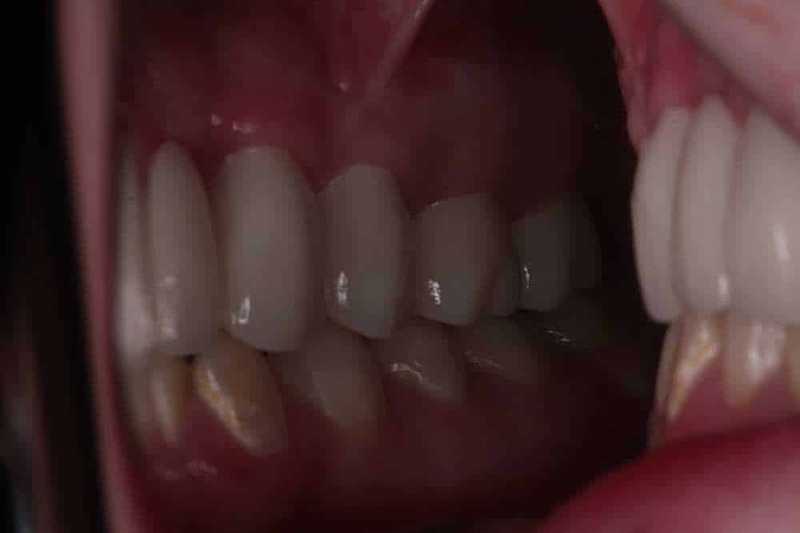 On this patient there was further complications in that the teeth are ankylosed, which means they are fused to the bone and can not be moved by conventional orthodontics (braces). 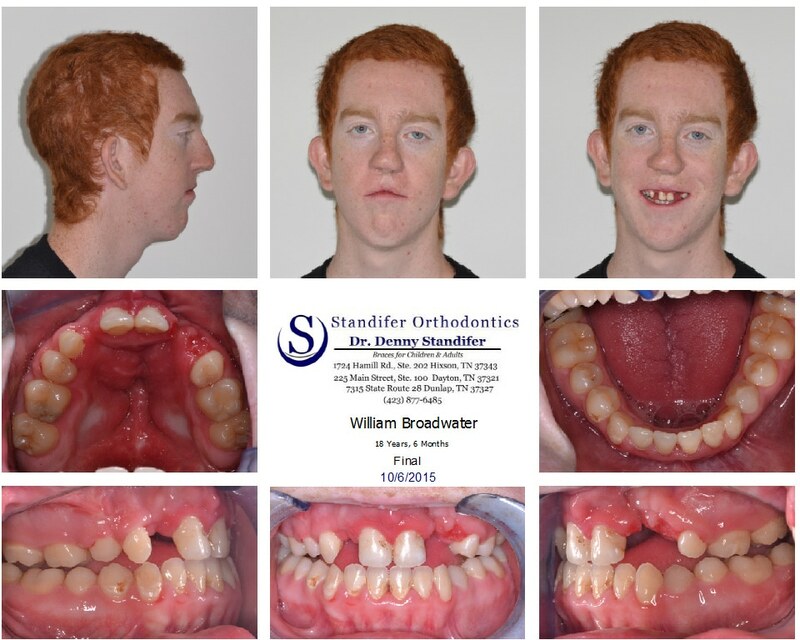 He spent many years in orthodontics and they were able to correct his bite and get the teeth is good alignment. The orthodontist did an extremely good job with this case. Because of the ankloysis of the teeth there was only so far the teeth could be moved. After the braces were taken off he was only able to bite on two spots in his mouth. The amazing thing was he didn’t know this was not normal, his parents didn’t know he only was able to chew in two spots either. When asked what he does when he eats a sandwich he says he just tears his food and does his best chewing it. We told him when most people bite a sandwich they leave a horseshoe bite mark in the remaining sandwich. 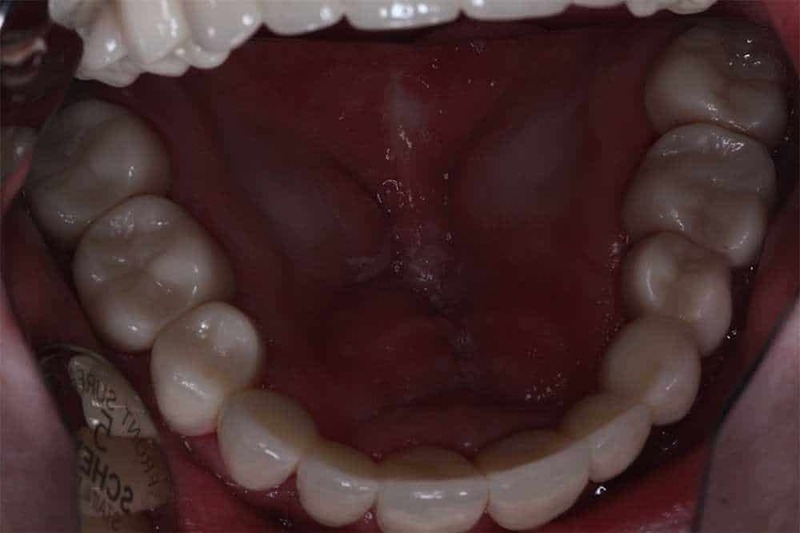 This case was started with a pre-operative scan with our Trios 3 Shape Dental Scanner. We sent the scan to Oral Arts Dental Labratory. There models were printed, using 3 dimensional printing. The case was then waxed up on the printed models and returned. The patient and his family returned and approved the wax up. A wax up allows us to show what the teeth will look like when they are done BEFORE we do anything. At this point if we want to change anything we can do it easily. The big day finally came we prepared his back teeth for crowns. Crowns were needed because the patient’s teeth did not come together fully. Doing crowns would allow for his teeth to come into a correct biting relationship. The front teeth were restored using bridges. Two bridges were needed in this case. One bridge was 6×8, the other 9×11. This allowed us to placed a pontic where his tooth was missing. No impressions were done, instead we scanned the teeth with the Trios 3 Shape dental scanner. This allows us to transmit the case to the lab via internet and they receive it immediately. Scanning is much more accurate and is much much easier on the patient. The laboratory prefers scans to impressions as well. This is a win, win, win. 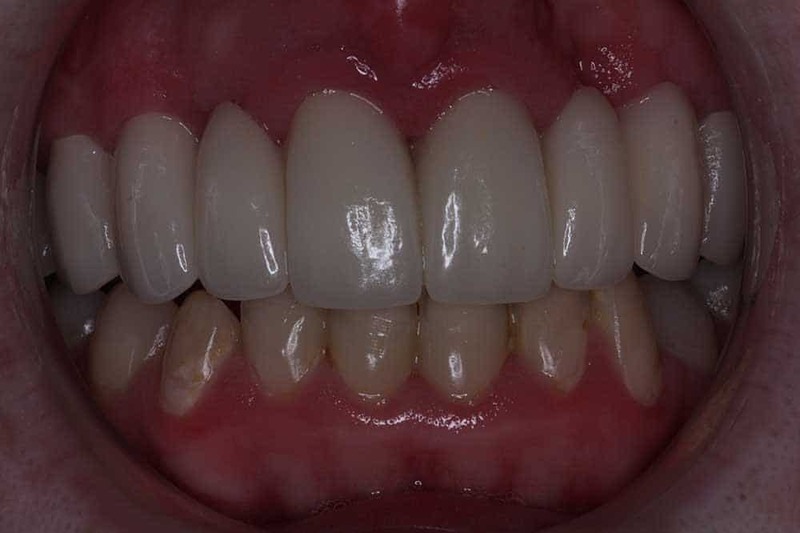 The materials used on this case was state of the art zirconia restorations. The back teeth are made of solid zirconia brand name BruxZir. This is a monolithic substance that is extremely strong. 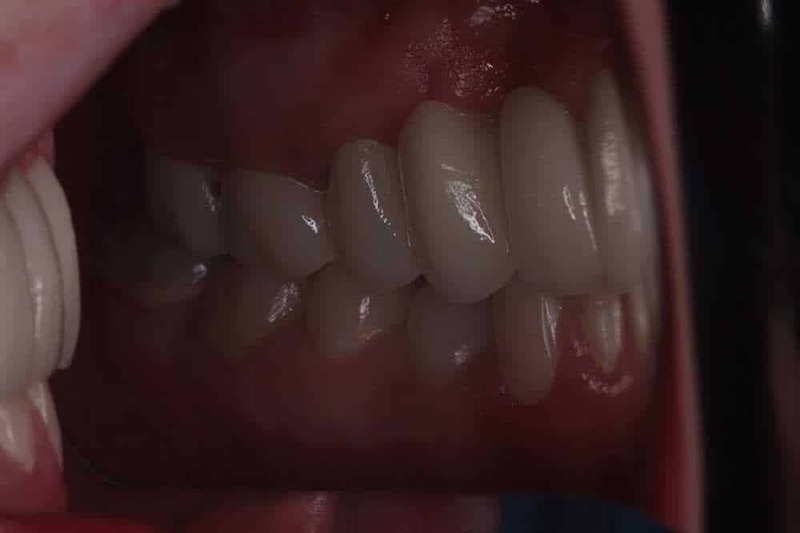 You can watch a video that demonstrates the strength of these Bruxzir crowns restorations here. These crowns are so strong that we have never seen one chip crack or break and we have been doing them for 7 years. We have done thousands of them without a single failure. Now that’s a track record. The front teeth were restored using the same zirconia as the back teeth but to make them more life like and beautiful we placed porcelain facings on them. So the front of the teeth are porcelain and the back and substructure is zirconia. This makes for beautiful teeth and state of the art dentistry. When the crowns and bridges were put on permanently. Tears of joy were shed. He was amazed at what it felt like to hit his teeth all the way around his arch. His mother said “Dr McOmie if I could I would pick you up and twirl you around.” A couple of days after the crowns were put in he told us, “I was eating a sandwich last night and I looked at the sandwich after I bit it, I left a bite mark like a horseshoe! It was awesome!” He is now in college and ready to succeed in life, with a wonderful smile!